Sgt. 1st Class Nathan L. Winder, 32, was a Special Forces medic assigned to the 2nd Battalion, 1st Special Forces Group (Airborne) in Fort Lewis, Wash.
Winder died June 26, 2007, from wounds sustained while conducting combat operations outside of Diwaniyah, Iraq. 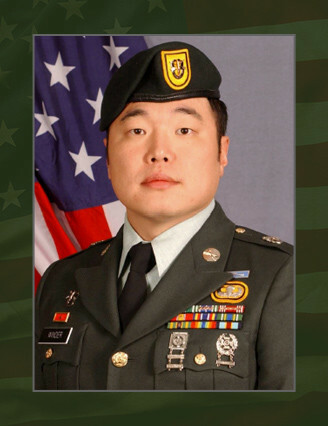 He was killed by small arms fire while assisting another U.S. Army element as a member of a U.S. Special Forces Quick Reaction Force. He was deployed to Iraq in support of Operation Iraqi Freedom as a member of the Combined Joint Special Operations Task Force – Arabian Peninsula. Born in Seoul, South Korea, SFC Winder was raised in Utah. After entering military service in 1993, Winder was assigned as an Infantryman to 1st Battalion, 41st Infantry Regiment at Fort Riley, Kan. He later served as a Bradley Fighting Vehicle section leader with 1st Bn., 9th Infantry Regiment at Camp Hovey, Korea, and as a dismounted squad leader with 1st Bn., 5th Cavalry Regiment at Fort Hood, Texas. In 2003, he was selected to attend the Special Forces Qualification Course at Fort Bragg, N.C., to become a Special Forces medic. He earned the coveted Green Beret in 2006 and was assigned to the 1st Special Forces Group (Airborne) at Fort Lewis. Winder’s military education also includes the Warrior Leader Course, the Basic Noncommissioned Officer Course, and the Basic Airborne Course. His awards and decorations include the Army Commendation Medal, 5 Army Achievement Medals, 4 Good Conduct Medals, 2 National Defense Service Medals, Korean Service Medal, Global War on Terrorism Service Medal, Noncommissioned Officer Professional Development Ribbon, Army Service Ribbon, Overseas Service Ribbon, Expert Infantryman Badge, Parachutist Badge, Driver/Mechanics Badge and the Special Forces Tab. He was posthumously awarded the Bronze Star Medal, Purple Heart, Meritorious Service Medal, Iraqi Campaign Medal, and the Combat Infantryman Badge. Winder is survived by his wife, Mechelle, of South Africa, and his son, Logan, of Herkimer, N.Y. He is also survived by his parents, Tom and Terri Winder of Blanding, Utah.